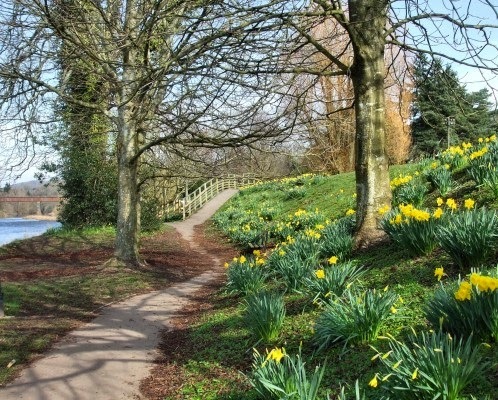 "An agreeable walk leads under the first arch of the bridge to the Abergavenny road, through a meadow planted with large walnut trees, by the side of the limpid and murmuring Usk"
I am very fortunate to live just a few steps away from the lovely 'Conigar Walk', a short length of footpath which runs alongside the banks of the River Usk, between Porthycarne Street and Usk Bridge. 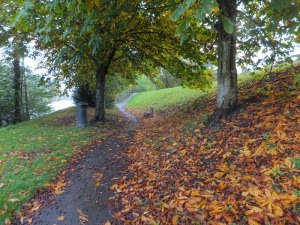 I walk this path almost everyday with my dogs before going to work. 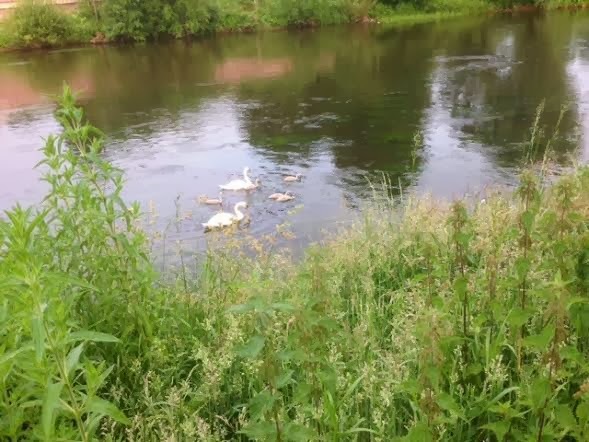 It's a great tranquil start to the day walking by the river - early mornings are a good time to see wildlife on the river but the path gets very busy in the summer, with local people and tourists enjoying a walk, sunbathing and a picnic on the river bank. 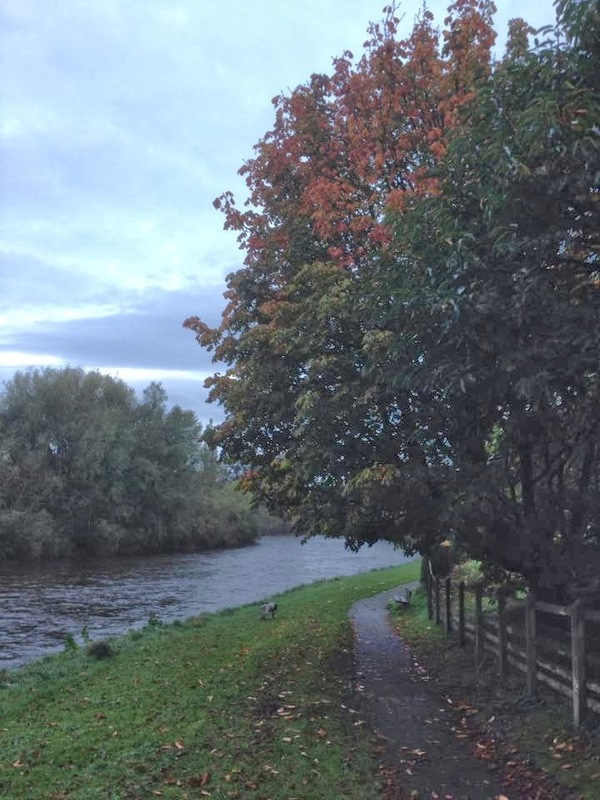 Today there are willow, sweet chesnut and horse chesnut trees on the walk rather than the walnut trees that were there in Coxe's time! 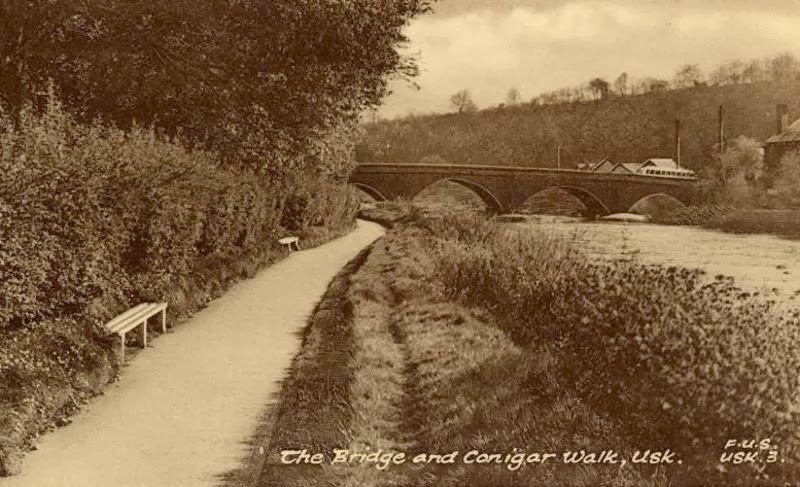 Although as the quote above indicates, a riverside walk through the meadow from Usk Bridge was obviously in existence at the time William Coxe was writing in 1801, the 'Conigar Walk' was formally created in 1856 by local business men J.H. Clark and Thomas Dunn, and opened in 1858, to mark and commemorate, the marriage of Victoria, Princess Royal to Prince Frederick of Prussia. 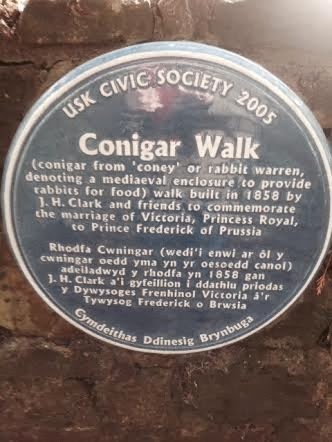 As the blue Civc Society, information plaques at either end of the Conigar Walk indicate, the name 'Conigar' is thought to be derived from the word 'coney', denoting a rabbit warren. 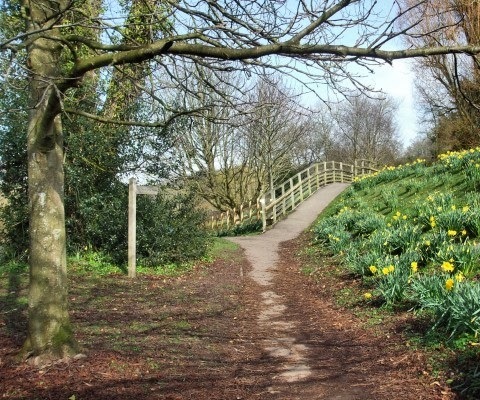 But equally it could also be derived from the Welsh name for rabbit 'cwningen'- which would still link the area to its use as a rabbit warren in medieval times, providing rabbits for food. 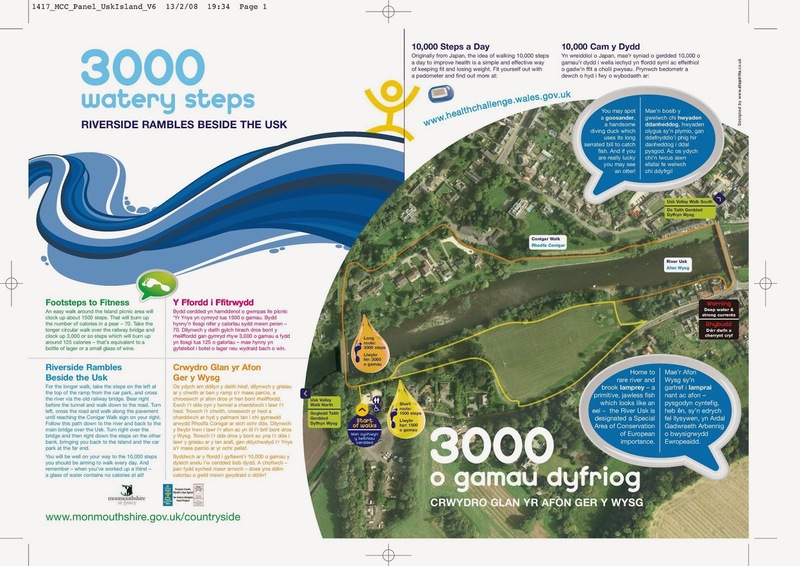 You can join the Conigar Walk from Porthycarne Street (Abergavenny Road) near Usk Vets or from Bridge Street near Usk Bridge. 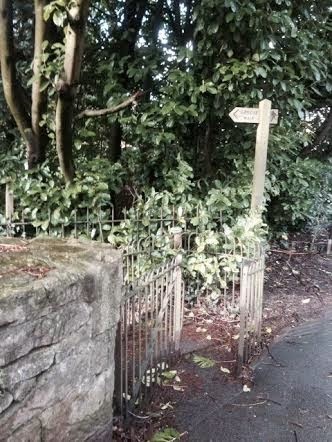 Both ends are way marked and have information plaques. 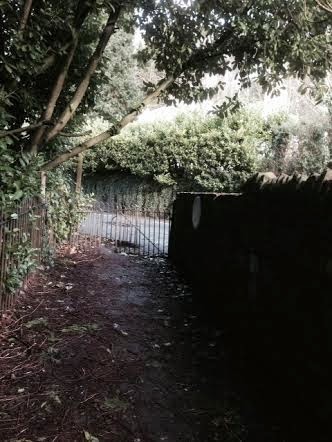 Pictured here is the Porthycarne Street entrance to the walk. 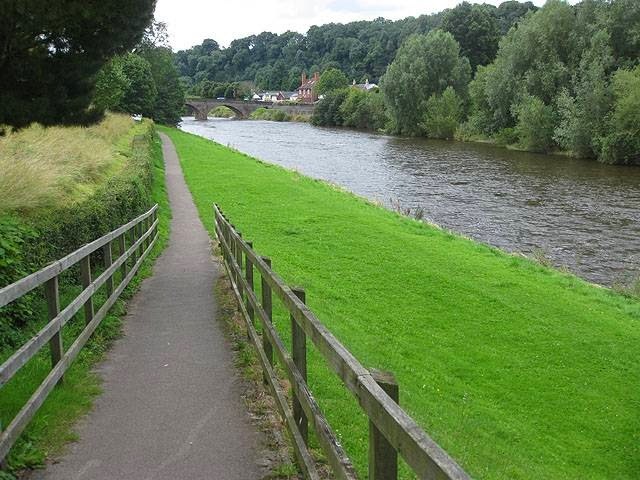 You can also join the path from Conigar Crescent or from the river bank when walking under Usk Bridge. 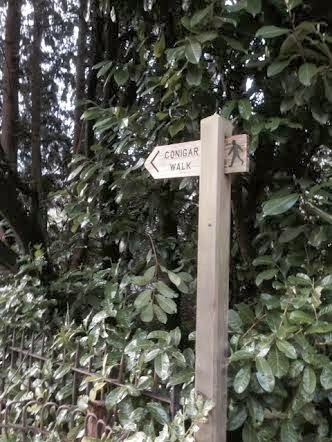 As you walk along The Conigar path it is hard in this sublime location, to think that you are very near the site of an extremely grisly excecution that took place 335 years ago. 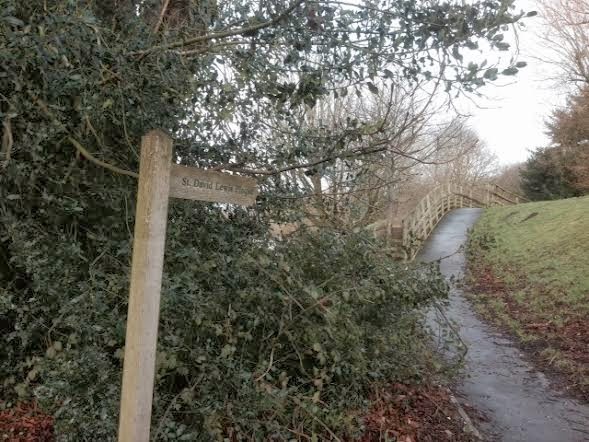 A sign post from the path points you up the flood defence bank to the location of the 'St David Lewis Plaque'. 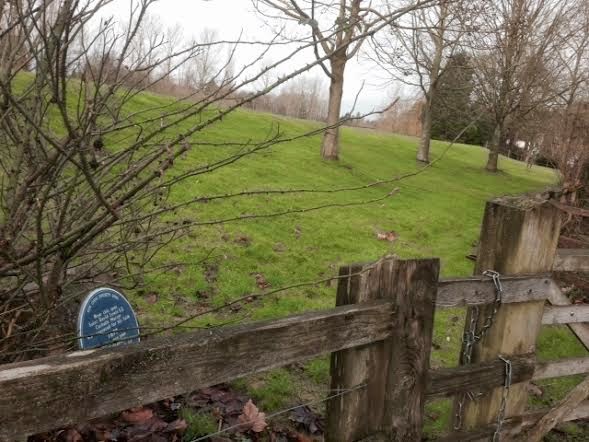 As you walk down the path into Conigar Crescent, you will see on your left through the fence, in the grounds of Porthycarne House, a plaque marking the site of the gallows where St David Lewis was executed in 1679. David Henry Lewis died for his beliefs. Born in Abergavenny in 1616 , he was raised as a protestant but converted to Catholicism and became a Jesuit priest after studying in Rome. 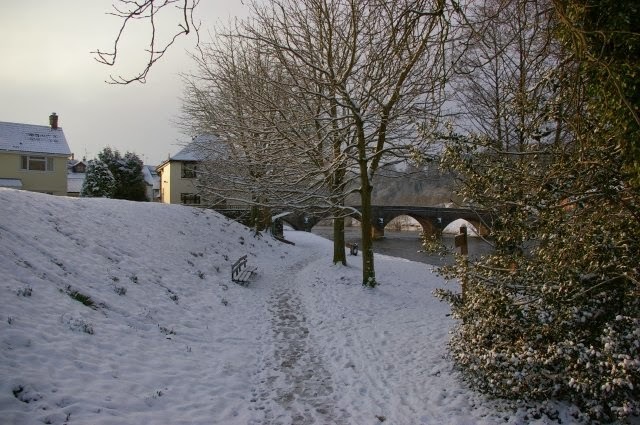 On his return to Britain David Lewis became Superior of the Jesuit College of St Francis Xavier at the Cwm on the border of Herefordshire and Monmouthshire. This period of the seventeenth century during the reign of King Charles II was a dangerous time to practice the Catholic faith. Despite the danger, David Lewis spent more than thirty years ministering to harassed Catholics. In an attempt to avoid detection and persecution, he adopted the alias of 'Charles Baker'. Between 1678 and 1681 a totally fictitious but widely believed plot emerged, in which it was alleged that Jesuits were planning the assassination of King Charles II in order to bring his Roman Catholic brother, the Duke of York (afterward King James II), to the throne. The 'Popish Plot' was fabricated by Titus Oates, a renegade Anglican clergyman. "He was tried at the assizes of Monmouth on 28 March 1679, the judge being Sir Robert Atkins, and the charge that of high treason. 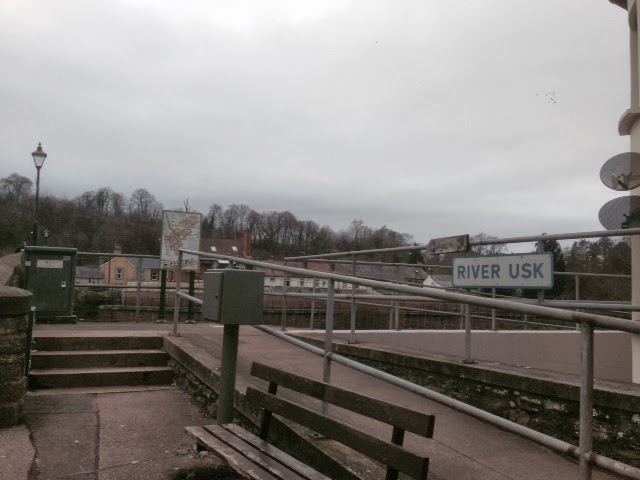 Found guilty by the jury, he was taken back to Usk Gaol, situate in Bridge Street, from whence on 27 August 1679, he was brought out and drawn on a hurdle to the gallows erected on the island (NB this is the site of Porthycarne House not 'The Island' on the opposite bank that we know today), where he was hanged. His body was then cut down and disemboweled, the bowels burnt, and the body buried near the south porch of the church (i.e St Mary's Church). 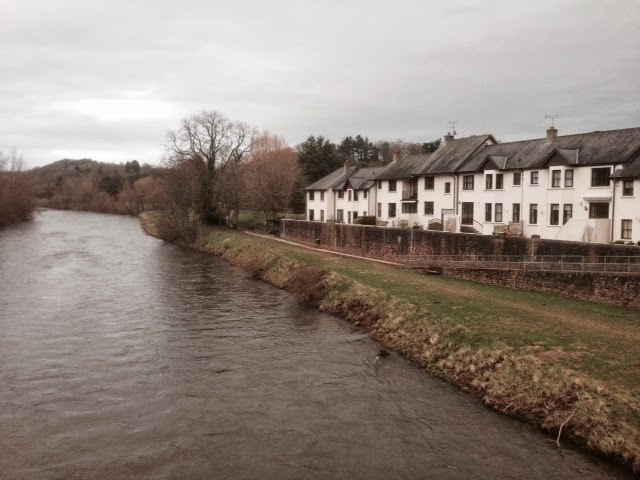 Jeremy Knight records that the execution of David Lewis was carried out in Usk rather than Monmouth because it was thought that Usk was less of a Catholic stronghold than Monmouth and that there would be less opposition. 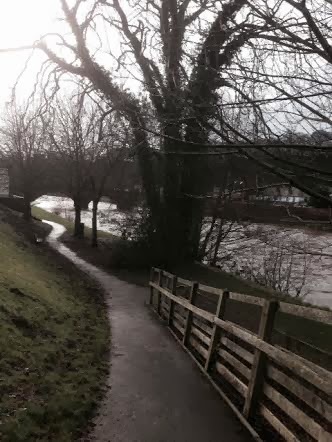 It appears however that many of the townspeople of Usk had sympathy for the cause of David Lewis. Carpenters apparently refused to build the gallows and the executioner allegedly ran away and a prisoner had to be bribed to carry out the grisly task. Many of the crowd that gathered to watch the execution, knelt during the sermon David Lewis preached prior to it being carried out and a lay preacher held his hand and prevented him being cut down from the gallows until he was dead. Normally with this type of execution, the disemboweling would have taken place while he were still alive and then the body would have been chopped up and its parts displayed in various locations. 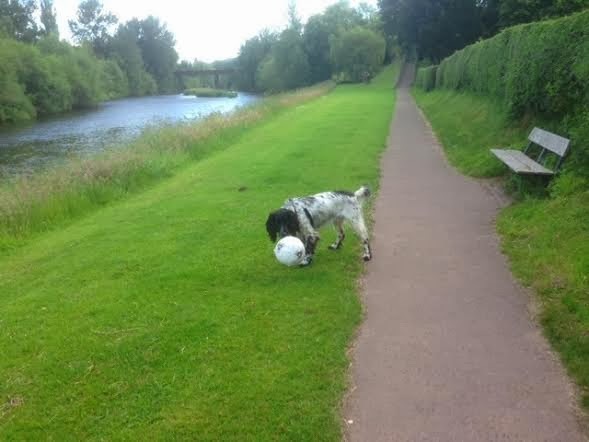 An execution of this type would have been very much like the horrific scene in the film 'Braveheart' (beware if you decide to watch it, the link I've provided to that scene in Braveheart is quite graphic) where William Wallace is hung, drawn and quartered. David Lewis' body was spared this treatment and it was carried in a respectful manner for burial at St Mary's Priory Church. 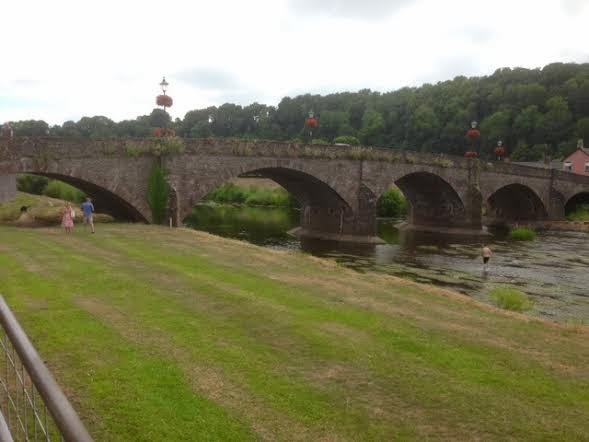 David Lewis wrote an account of his own trial before he was executed at Usk on 27 August 1679. He was beatified in 1929 and Canonised as one of the Forty Martyrs of England and Wales in 1970. Usk's Catholic Church, the church of SS David Lewis and Francis Xavier was built in Porthycarne Street, in 1847. The original dedication was to St Francis Xavier but St David Lewis was added after his canonisation by Pope Paul VI in 1970. 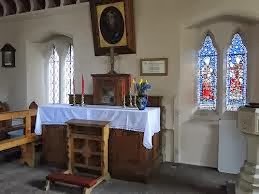 In the church, near the font, there is a shrine dedicated to St David Lewis, where he is shown with the rope and knife, the instruments of his death. 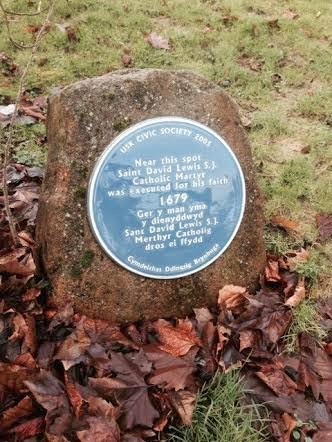 Outside is an information plaque marking the original gravestone of St David Lewis. 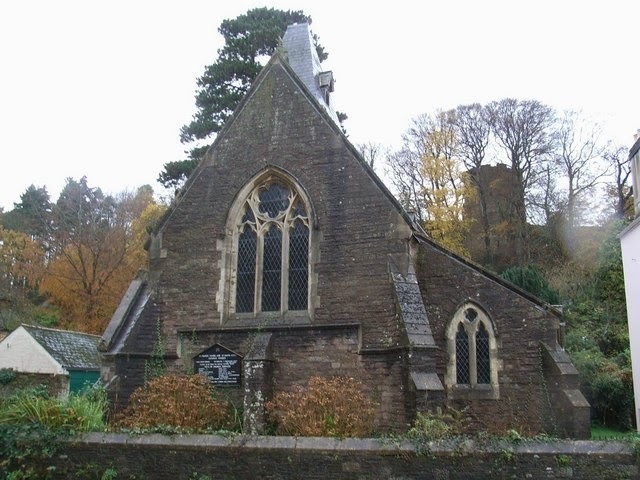 However David Lewis' grave is actually outside St Mary's Church, Usk near the main door. The original grave stone was replaced by a modern stone when David Lewis was canonised in 1970. 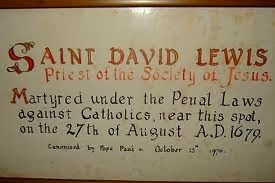 Know as 'Tad y Tlodion' - 'Father of the Poor'', David Lewis was the last Welsh Martyr. 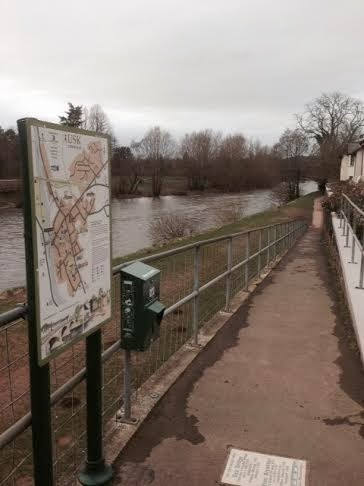 It is hard to believe that such significant but dreadful things happened here by the river bank in quiet little Usk. Film script anyone?? 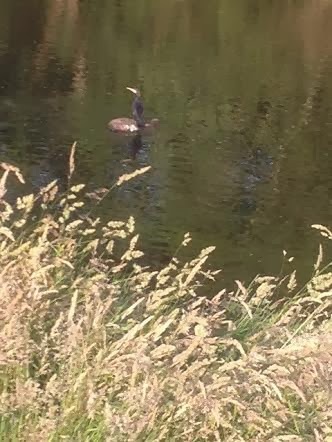 ?You have to acknowledge it is an amazing if rather grisly story! 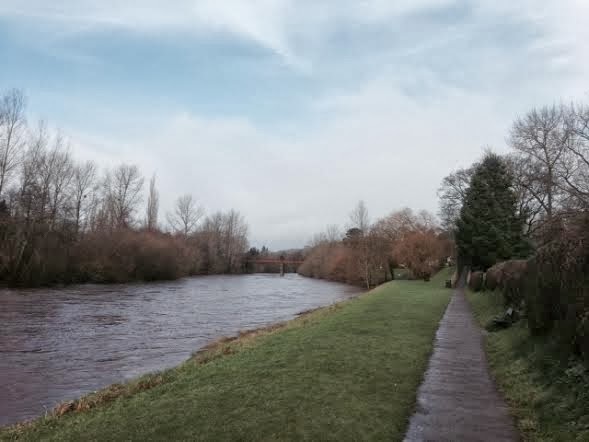 Although the Conigar Walk passes right alongside the site of this really horrific execution, I have never experienced any bad vibes or feeling of forboding walking along it - today, as in the nineteenth century, it is a very popular 'leisure facility' for the people of Usk and is enjoyed by many every day, at all times of the year! 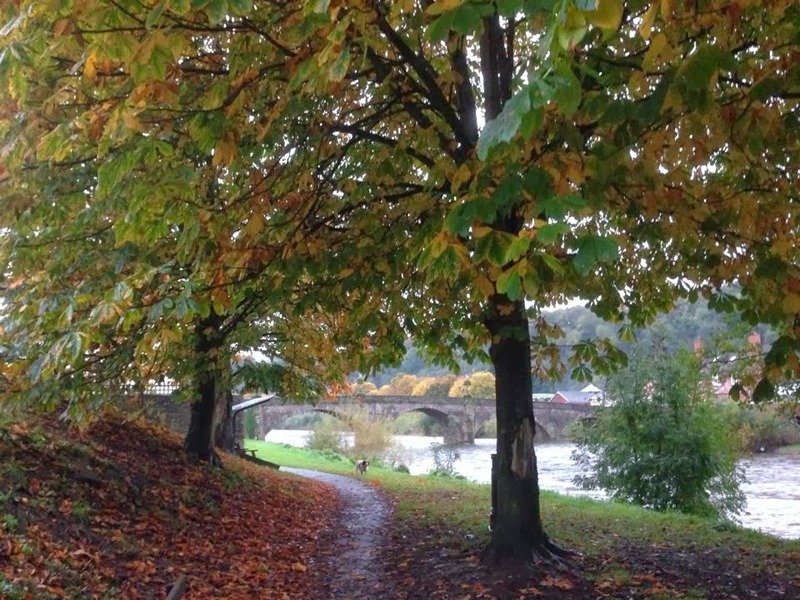 The Conigar footpath is a pleasant walk at any time of the year - 4 views, 4 seasons!